Just wanted to remind everyone about our Silent Auction which is currently in progress. We now have about 80 items to bid on, with more promised to arrive tomorrow for the Grand Finale. Our most recent donation is a romantic night’s stay for two at a local B&B and includes a catered dinner brought to your room as well as a two-course gourmet breakfast in the morning. Please join us from 7-9 pm at our Point Grey location, 4437 West 10th, for lots of fun and games, including appies and beverages. All proceeds go to the BC Cancer Foundation in support of our team Ride to Conquer Cancer. 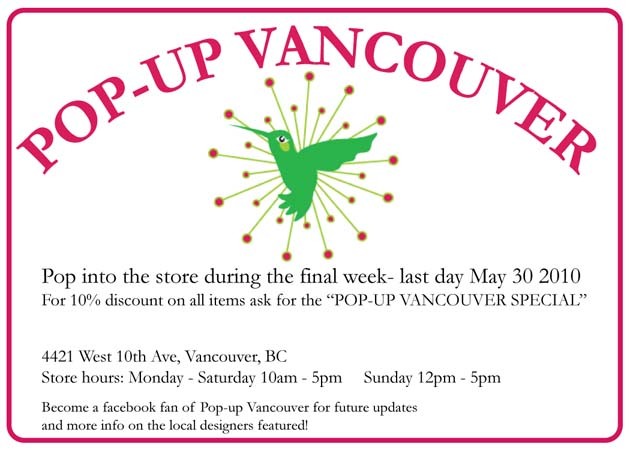 And another reminder that this is the last week to enjoy Pop Up Vancouver’s fabulous selection of items from local artists with 10% off all items if you ask for the Pop-Up Vancouver special! This entry was posted on Thursday, May 27th, 2010 at 4:13 pm	and is filed under Uncategorized. You can follow any responses to this entry through the RSS 2.0 feed. Both comments and pings are currently closed.